WASHINGTON (May 18, 2012) -- The Army's Golden Knights and the Navy's Blue Angels headlined at the 2012 Joint Service Open House here, which ran May 18-20. But not many visitors to the open house will get to crawl up on a Navy F/A-18 Hornet, the Blue Angel aircraft, or the Fokker C-31A that Soldiers jump from during a demonstration by the Golden Knights. Two boys peer into a crew hatch on an Abrahams tank during the 2012 Joint Service Open House at Joint Base Andrews, Md., May 18, 2012. On the flight line at Joint Base Andrews where vendors sell ice cream on a stick and falafel, the Army has some if its more common equipment on display, along with the Soldiers who train on and deploy with it. 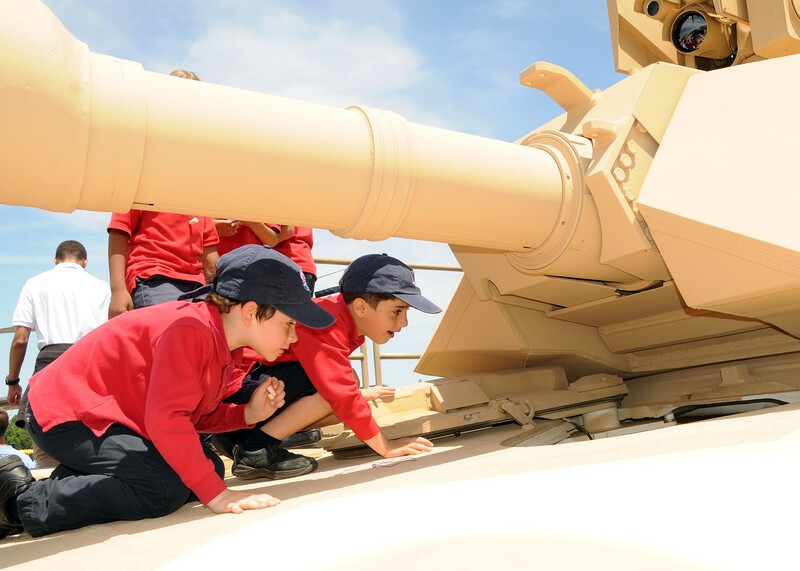 Those Soldiers don't seem to mind the poking, touching, and climbing that comes from letting hundreds of school children explore the military hardware they work with every day. The AH-64D Apache can sometimes win a fight without firing a round, or missile, said Chief Warrant Officer 2 Josh C. Benton, with the 1-130th Aviation Battalion out of Raleigh, N.C.
"They drop their guns," Benton said of those who see the Apache approach. "It's a fearsome aircraft. We always try to do a show of force, rather than shoot first." Benton has been to Iraq once with the Apache, and has about 800 hours in the air inside one. "The mission for the Apache helicopter is reconnaissance and attack," he said. "And this one performs really well for us." Leading up to the cockpit of the aircraft was a set of stairs, where school kids and the children of military personnel could look inside. "They ask what's this piece, what's that piece," he said. "The kids -- they are interested in how fast you can fly, how far you can fly. That's the kind of questions they usually ask. Their dads usually want to know the caliber of the gun, and how far the rockets can shoot." Both Benton and the aircraft are on display at the open house. "We're here for the airshow, to show everybody what the aircraft is about and let them get up close and personal on it," he said. "It's a little bit of Army public relations." After they get down from the aircraft, Benton said, he hopes they remember at least two things: the name of the aircraft, and the role it and he plays in America's defense. "That's air support," he said. Perhaps not as impressive as the Apache, but maybe more fun for the kids to see, is the "laundry advanced system" or LADS. It's a washing machine on wheels that can both wash and dry Soldier clothing in the same drum, providing a "dry-to-dry" solution for up to 500 Soldier each day. Kids were taking "rides" inside the drums of the washing machine. They weren't turned on, of course, but the kids were doing flips inside anyway. 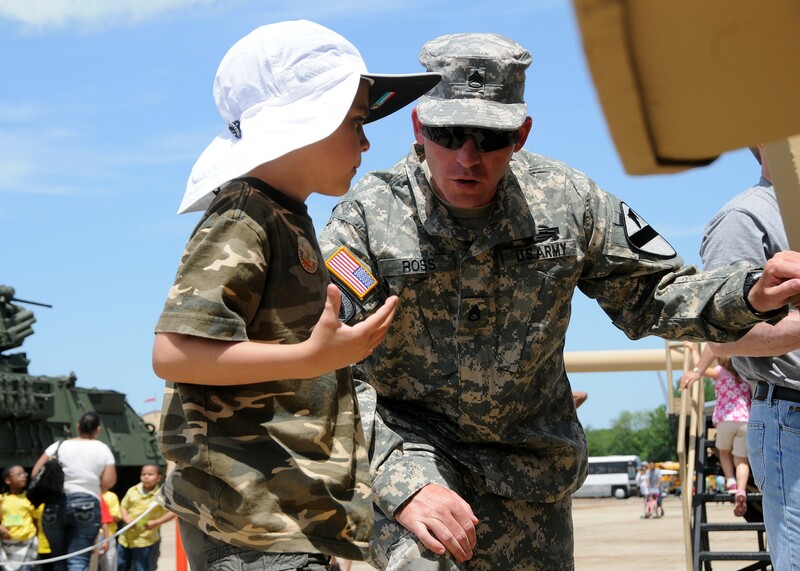 "Most kids don't have a question, they just want to ride in the drum," said Pfc. Andrew S. Pfeifer, a shower, laundry and textile specialist with the 611th Quartermaster Company, a Reserve unit in Maryland. Pfeifer has been in the Army since 2006, and has been to Iraq once. There, he said, he served at Forward Operating Base Normandy, where one of the very same LADS was in use. It was eventually replaced with contractor support. "I think really it's for smaller FOBs (forward operating bases), to give them laundry when they don't have contractors," Pfeifer said. Staff Sgt. Alvin P. Williams, also with the 611th Quartermaster Company, said the service he and his unit brings to the fight is "a big value for Soldiers. It's important for Soldiers to keep themselves clean, as far as hygiene is concerned. And we take care of their equipment, as far as uniforms are concerned. We bring in the equipment and we run showers 24 hours. A hot shower and clean clothes goes a long way." 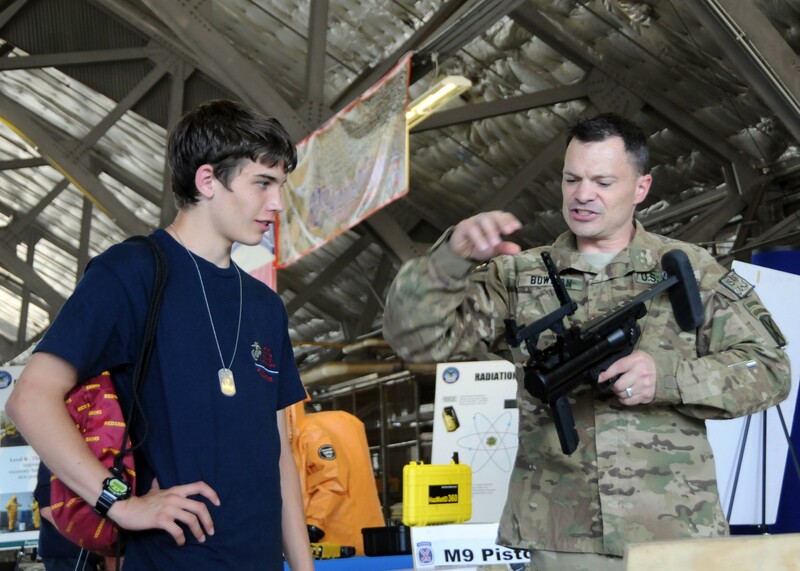 Maj. Silas R. Bowman explains the M-320 grenade launcher attachment for an M-4 carbine, to a visitor at the 2012 Joint Service Open House at Joint Base Andrews, Md., May 18, 2012. Nearby, Staff Sgt. Armando Perlaza, of the 327th Field Artillery Regiment at Fort Bragg, N.C., mans the M-142 High-Mobility Artillery Rocket System. The rocket-launching system is truck-mounted, weighs about 15 tons, and can be carried on a C-130. "It shoots off these rockets ... the range is 270 kilometers. That's why we are the king of battle," Perlaza said. Perlaza has been a Soldier for four years now, and before that, he was a Marine. He says he loves them both, and that he's been once to Iraq and twice to Afghanistan. At the open house, he said, visitors primarily want to know the capability of the rockets the HIMARS can launch. "Everybody wants to know how far this vehicle can reach out and touch someone," he said. What Perlaza wants them to know, however, is a little different. "The main thing we like to show people is that we are here for them, and that we do this every day, just to keep this country safe, and keep what we have today," he said. "This is the king of battle, and we contribute a lot to that." SO YOU WANNA BE A CARGO PILOT? "I've had several questions about how did I become a pilot, how did I get into flying," said CW2 Jeffrey A. Luther, a CH-47D Chinook pilot and Army reservist out of Fort Eustis, Va., with B Company, 5/159 Avn. Regt. "One gentleman wants to be a pilot. He's a senior in high school. So I explained the process to him." That process starts with the right score on the Armed Services Vocational Aptitude Battery, Luther said. Then, it's filling out the forms and applying, and hoping you get accepted. "You go visit an aviation recruiter," Luther said. The Chinook is a heavy-lift aircraft that "does cargo or passengers," Luther said. With the Chinook, he's been to Peru, Iraq for nine months, and "just about every state in the country." Visitors, he says, when they aren't asking how to get his job, want to know how many people the Chinook will hold, what it does, and what its name is. "A lot of kids also ask what do you do in an emergency, how do you get out, or do we parachute out?" he said. The answer to that, he said, is no. "We go down with it." After doing a little more than four years in the Navy, Luther left the service and got some more education. Then he came back to the Army. It's been 12 years total for him in uniform now, he said. He and six Soldiers came up from Fort Eustis to the open house to show civilians, he said, what the Army is all about. "It's the exposure we have with people that don't know what we do," he said. "It's our chance to explain to people who don't know what we do, why we do it, and what the effects of it are." Staff Sgt. Joshua L. Ross talks with a visitor in front of an M3A3 Bradley during the 2012 Joint Service Open House at Joint Base Andrews, Md., May 18, 2012. The Humvee doesn't meet the requirements any longer for going "outside the wire" in a combat zone. It's simply not safe enough to do so. But there are several better vehicles out there, included among those, the speedy, safe, mine-resistant, ambush-protected all-terrain vehicles, known as M-ATVs. "It's very easy to drive, and quicker than a Humvee," said Staff Sgt. Jamaal N. Moragne, with the 215th Brigade Support Battalion, 3rd Brigade, 1st Cav. Div., out of Fort Hood, Texas. "The M-ATV is an upgrade of the Humvee. It's more technical. It can go up and down mountains. It's meant to go on more terrain than the traditional Humvee." Moragne is a logistics platoon sergeant, he's been to Iraq twice, and he's new to the M-ATV. He's training now on the vehicle and will eventually be a truck commander. "We're learning now to drive, to maneuver, to do our basic battle drills out of it," he said. More important than its speed, he said, is the safety he feels in the M-ATV. "It has the upper armor on it," he said, and the M-ATV repels blasts from improvised explosive devices. "You feel safe in every mine resistant ambush protected vehicle. There's not an MRAP you don't feel safe in, compared to when the war first started." Moragne said he wants kids and their parents who come see the M-ATV to know it's Army training, and vehicles like the M-ATV, that keep Soldiers alive. "They should know what we do on a daily basis in combat, and the training that we do to make sure that America's sons and daughters are safe," Moragne said. Not everything at the open house was outdoors, or could be crawled inside. In a nearby aircraft hangar, units from around the Army had set up displays to showcase to visitors what it is they do to defend the United States. "Can I pick them up, can I play with them?" said Staff Sgt. Randall J. Fuller, of the 10th Mountain Division, repeating queries of the many young men who were gathered around the displays. "One kid asked me what is the best thing about my job. Well, not only am I a Soldier, but I am also a medic in the Army. My job is to sustain life. The best part of my job is knowing that each and every one of those Soldiers that does get hurt, they know they can rely on me to take care of them. That's the favorite part of my job." Fuller said most of the visitors to his display are drawn to the M-4 carbine with the M-320 grenade launcher attachment, "that's their favorite thing to see, so far. It just looks cool," he said. The officer in charge of the detachment of Soldiers that made their way from New York to Maryland is Maj. Silas R. Bowman. He said what's important for visitors to see is that Soldiers are people too -- just like them. "They need to know how professional we are, and what kind of equipment we've got," he said. "And they need to see that we're average citizens who decided to join the Army and serve our country by defending our country. When a kid picks up a weapon -- he's 10 or twelve years old -- he's able to pick it up and look at it, he's able to realize that several years from now, he could do this too." Fuller said he wants visitors to know he's more than a medic, more than a rifleman, more than a platoon sergeant, and more than a Soldier. "We want people to understand, we are not just Soldiers," he said. "We are husbands, wives, sons and daughters. We're regular people. We just represent .1 percent of the United States." This year's open house features, among other things, performances by the Army's Golden Knights, the Navy's Blue Angels, a performance by a team of F-16 Fighting Falcons, an MV-22 Osprey demonstration, and an F-22 Raptor demonstration. Additionally, on display is static aviation equipment and ground equipment from all branches of the U.S. Armed Forces.